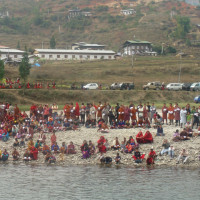 Visit to one or more festivals. Optional hike to Taktsang (tigers nest) Monastery and Chimi lhakhang. 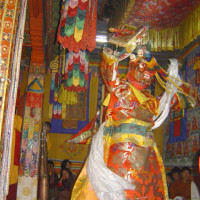 Escorted locally by expert and friendly Bhutanese Tour Leader. 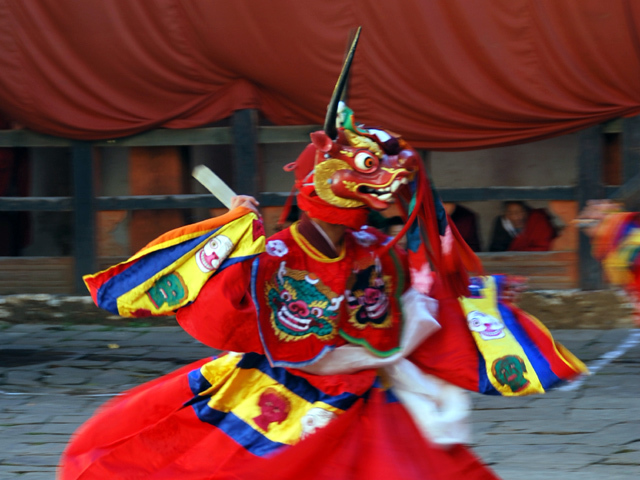 The Kingdom of Bhutan is one of the world’s little known treasures. 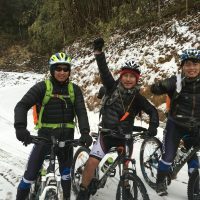 Here in the “Land of the Thunder Dragon,” quality of life is measured in terms of Gross National Happiness, instead of material success – though Bhutanese live comfortable, serene lives. 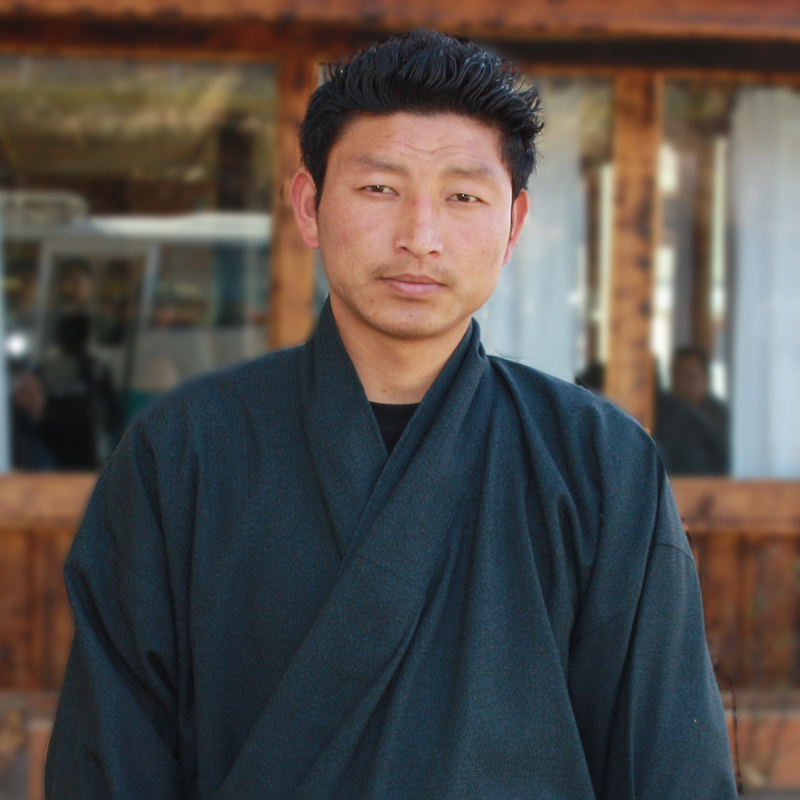 Until quite recently this tiny country remained in splendid isolation, dedicated to preserving its rich Buddhist traditions and pristine landscapes. 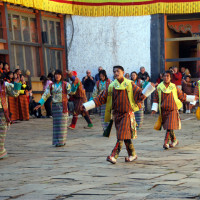 Small number of guests each year, visit to discover Bhutan’s natural and cultural wonders. 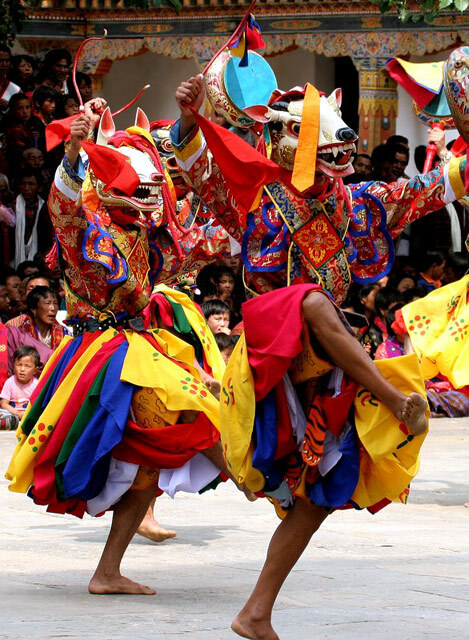 On this Dragon festival trip, you will attend at least one or multiple colourful festivals, and get insight into Bhutanese culture and tradition, while visiting its unique fortresses, monasteries and ancient temples. On few occasions, your dinners will be hosted by local families. We’ll visit local farms, villages, schools and have an opportunity to meet and learn from locales. 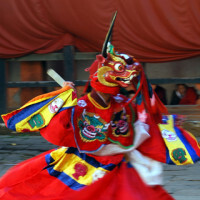 First introduced in 2001, Dragon Festival Tour has be modified slightly each year, to keep up with changing conditions. 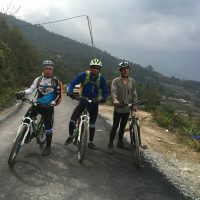 As the Road Widening Project has somewhat slowed the driving, this year, we added one internal flight and one extra day to allow good pace of the tour, without feeling that too much time is spent on the road. Join us on this definitive Cultural immersion Journey, among ancient monasteries and temples, Himalayan peaks and glacial rivers, rare flora and fauna and extraordinary people. We assure you that this will be one of your most memorable trip. 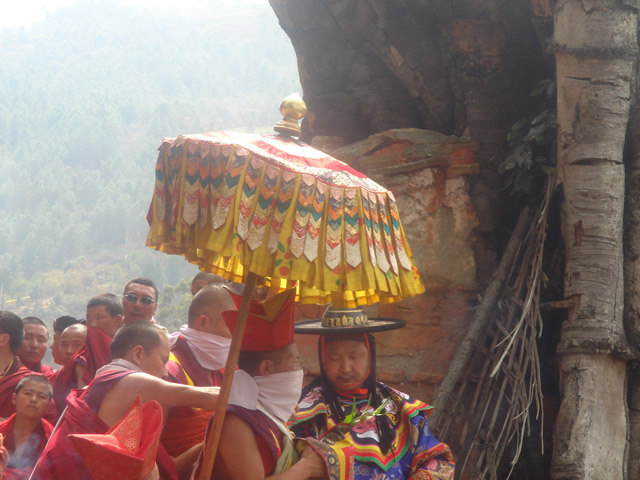 Upon arrival by flight into Paro airport, meet/ greet and transfer to the hotel, where we spend two nights. Serene Paro at 7,500ft is one of Bhutan’s most fertile and most beautiful valley. 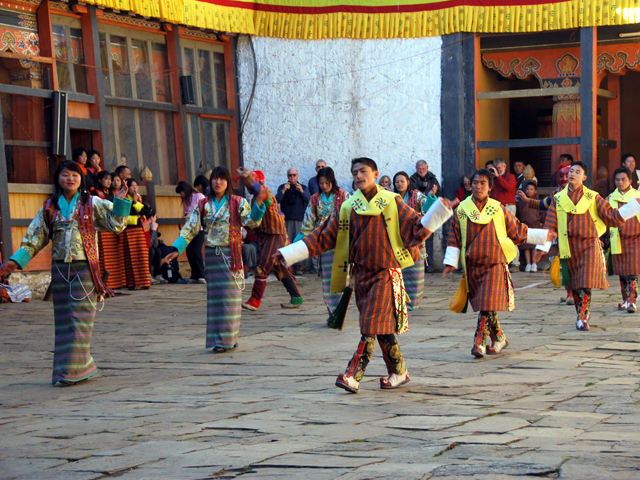 A short, and scenic flight whisks into Bumthang, the spiritual and cultural heartland of the Kingdom. A short drive takes us over to Chumey valley. Continuing on across Youtongla pass, arrive at Trongsa, a small town, perched above a gorge, high above the Mangdechu river with a most spectacularly sited Dzong. Normally a 3hr journey, the current road condition is likely to take more, and hence it is also a necessary stop. Phobjikha or Gangtey is a wide glacial valley with a central stream meandering through the open grassland and thickets of dwarf bamboo. Farmlands occupy the peripheral slopes where potatoes and turnips are grown. The central area is a marsh land protected as habitat for wildlife. At 2900m, this is the highest night halt on your journey. The valley is a protected (Conservation) area and is both scenically and culturally worthwhile. 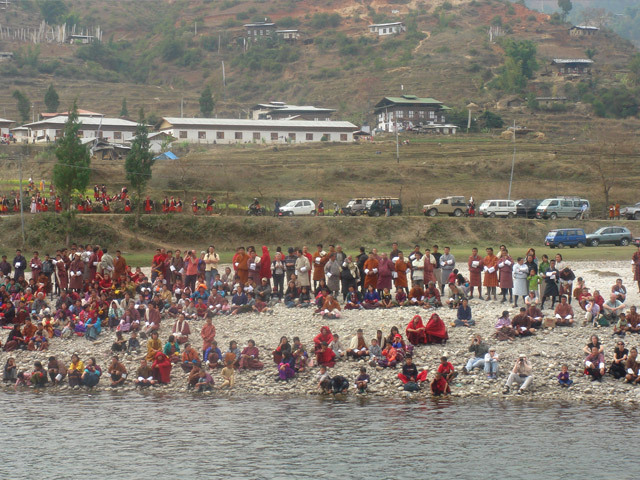 Punakha and Wangdue Phodrang two separate towns, but they are located nearby like twin towns. The valley is at a lower elevation of about 1250m above sea level and therefore it enjoys subtropical climate; with warm summers and pleasant winters. Cactuses, Mandarin, and Bananas, Guava, grow alongside rice crops, in terraced fields, gently slopping down the hillsides; one of the most delightful sight to see. 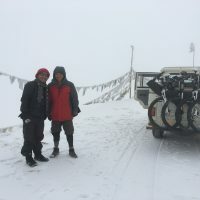 En-route, enjoy the panorama of snow capped peaks, including the highest mountain in Bhutan from Dochula pass, over a cuppa. Then spend the next two nights in a comfortable hotel, and visit Thimpu, which is still the most relaxed capital in the world, without any traffic lights ! In addition to its many attractions, you will have time for shopping, to go the post-office to send off Postcards, see an archery match and colorful farmer’s market. Our journey in Kingdom culminates into a hike to iconic Taktsang (tiger’s nest) monastery, the most famous site in Bhutan. 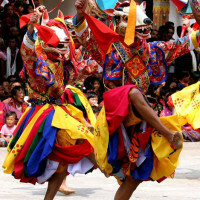 Drive short distance to Paro and begin this famous hike, for which you can also hire a riding horses. After breakfast transfer to Paro airport according to your flight times. Please note that the schedules are revised for each trips to incorporate the festivals and events. Trip AccommodationHotel are tourist standard 3 to 4* category. It is tiered priced , ranging from USD$ 2700-3550 based on number of participant. Contact us for details. 02 Oct, 2019 13 Oct, 2019 Attending Wangdue & Thimphu Festival Open Book now! Local English Speaking Tour leader/Guide. Flights into and out of Bhutan (listed separately). Travel & Medical Insurance ( Recommended). All optional expenses such gifts, tips (optional), laundry, bars and beverages and other personal expenses not listed in the included section. 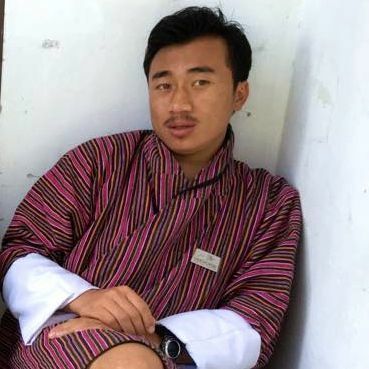 Dear Yonten, We've had the most memorable trip in Bhutan. Please send our thanks to the Windhorse team behind the scene who makes sure that our trip is safely arranged and well-organised. We are specially thankful to Kinley and Tshewang for a wonderful trip, they always went beyond our expectations to make sure that we enjoy the trip the most, from small little things like buying newspapers everyday for me, borrowing scarfs for all of us, driving with at most care, to trying to give us a taste of true Bhutanese cuisine. They are very professional at work and we found them great companions, true friends and we've learnt a lot from them. 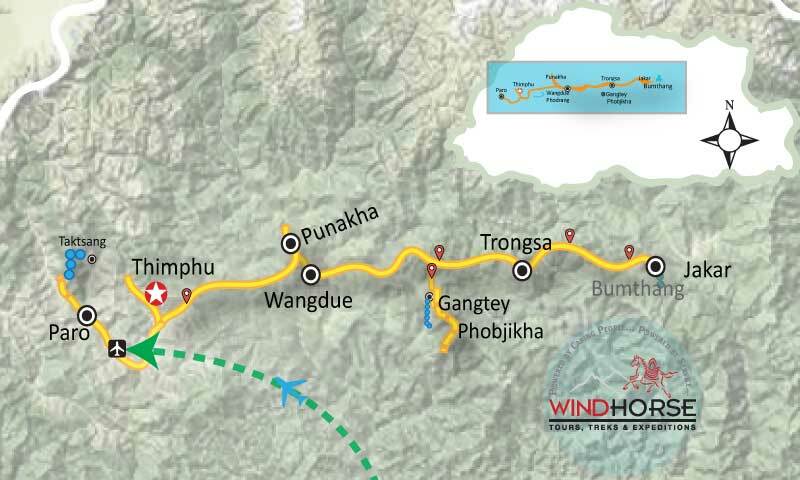 I would definitely recommend Windhorse team to any of my friend who is planning to go to Bhutan. 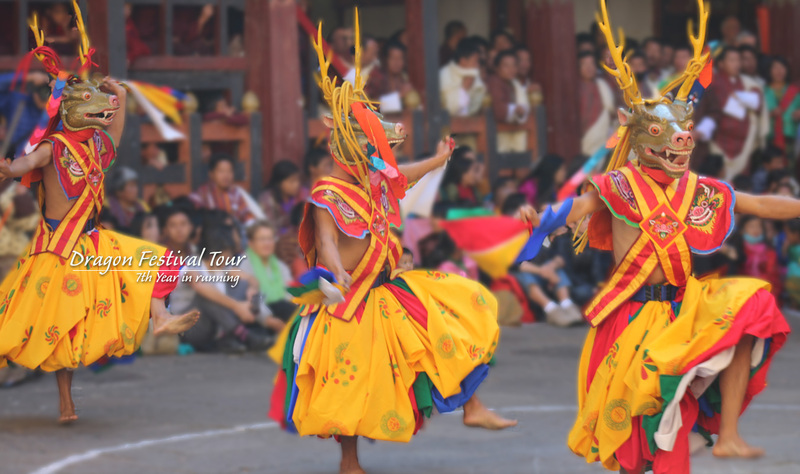 TID 8538 Bhutan Dragon Festival (4 Oct - 15 Oct,2014) Overall, the trip was quite nice. We didn't like the change in accommodations for the first 2 nights. I suppose it was a little like a bed and breakfast, but it was a bit uncomfortable to have to share the apartment with somebody that we didn't know. We did get the master bedroom, so that was at least better than it was for the single person, but still we had to be pretty much fully dressed to come out of our bedroom. We had a tub in the bathroom, but it was so dirty that we would have needed some heavy duty cleaners to even use it. You were definitely right about restroom facilities and food quality on the trip. In the Mountain resort, the bathroom floor was wet all the time around the toilet and even sitting on the toilet, my ankles were getting sprayed constantly. The food was very repetitive at every meal. On the bright side, everything we saw was wonderful. Sonam, our guide was fantastic. He was quite knowledgeable about the history and culture and very observant to help any of us who needed anything. I am diabetic and was having some really high blood sugars from the types of food that we had because it was so high in carbohydrates. When he saw, how I had started limiting my food, he asked me what would help and arranged to have hard boiled eggs at our meals to help me eat more protein. Others, also started to look forward to the eggs and enjoyed them. I, also, was breathing quite heavily at the altitude, when we went up hills. On the first day we went on a hike, he told me that he would suggest that I use the horse option at Tiger's Nest. I told him that I had intended to but had read on the Internet that they weren't always safe because the horses walked on the edge of the cliff and that one man had even fallen 40 feet. He told me that he would lead my horse so that I would be safe. He really went the extra mile to make sure that everyone who had any needs was taken care of. The other young guide that was with us, Kenchup (not sure how to spell his name) was also very nice and tried to help anybody who needed anything. The driver's were great. They were safe and personable. They would stop for any pictures that we wanted along the way. I'm happy that we were able to visit a country than is so unique. 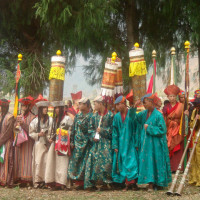 The people of Bhutan were welcoming and friendly. We met some lovely Bhutanese. Liked the Takin excursion, as well as other animal stops to take pics of monkeys and yak. Enjoyed the festivals, hikes, and temples. The giant Buddha is beautiful. Also, the markets were good. Dragon Festival Tour (Oct 2008) Thanks Ugen, We thoroughly enjoyed our trip. Everything went very smoothly. Sonam was a wonderful guide and LB was a great driver. The country was beautiful and the people were very friendly. We especially enjoyed interacting with the children – they were a delight. The weather was picture perfect. We were surprised at how warm it gets in the sun – we were not quite prepared for that. We loved staying at the Villa Italia. We were invited for tea by Patrizia and Ugyen and enjoyed that unexpected experience. With the exception of the one night, our other accommodations were acceptable. The van was quite comfortable for our long drives and it was nice to be able to spread out. We would definitely recommend Wind Horse to others. There can not be enough said in regards to the professional commitment displayed by Ugyen and the staff selected during my tour of Bhutan. 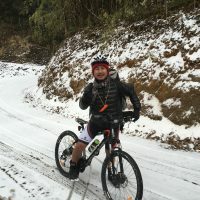 Ugyen provided exactly what he has posted on his website and more. 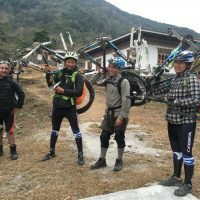 Before selecting Windhorse, I had done about 4 years of research on the best way to get to Bhutan. I am not particuarly fond of group tours so it was important for me to travel with a small group. Since at the time I could not afford a private tour, I was all set to go with a company that charged twice as much with the minimum amount of guest three times that of Windhorse. 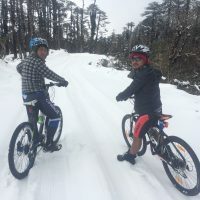 I am thankful to have come across Windhorse and when I called the number listed on the website and actually spoke with Ugyen, I was beyond impressed. He treated me as if I was his first and only client (of course I know better). This is how he and his treated me during entire planning stages and actual tour. The staff at Windhorse are proud of their country and company, and it shows with their personal care for each clients needs. I truly enjoyed my trip. 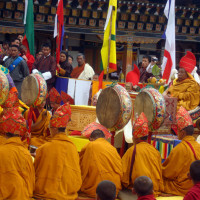 I have been back to Bhutan since my first tour in Sep 2005. Thanks to Windhorse, Bhutan has my heart. I LOVE this magical place and will continue to visit there whenever possible. 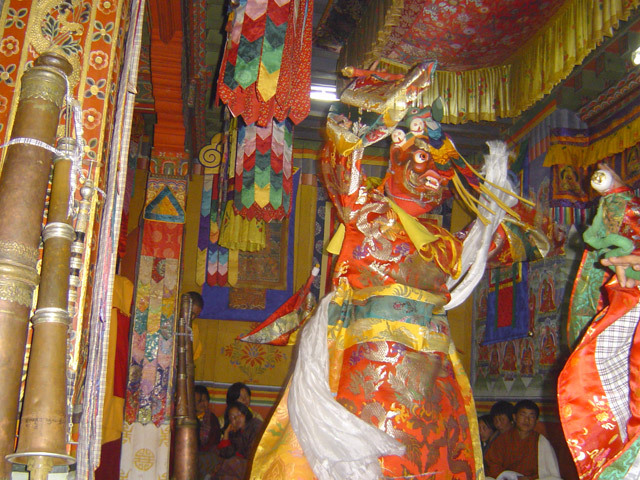 I will also continue to refer Windhorse to anyone that has an interest in visiting Bhutan. I will refer them not only because of the reasons mentioned above, but because I can not imagine touring this country with any other company. Unless, one is fortunate enough to gain a personal invitation, Windhorse is the ONLY way to see this little Kingdom....PERIOD! Except for the hotel in Thimphu, I was satisfied. 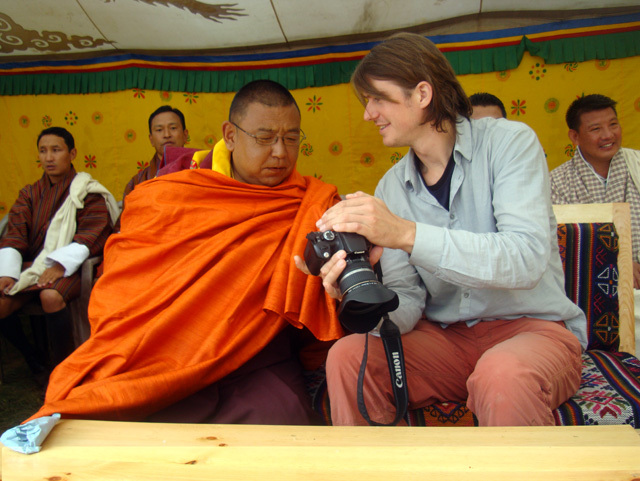 Pelton, the guide, demonstrated excellent service, insight, and knowledge of tantric Buddhism, which I have a particular interest to investigate. 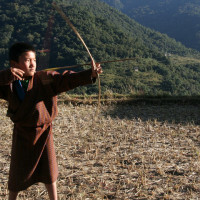 I would travel again to Bhutan, provided the guide had the professionalism of Pelton. 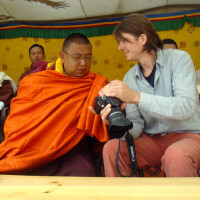 I am also interested in another trip, possibly to Tibet or Nepal. I would book with your tour group again. Bhutan Sept 30-Oct 9, 2006 The trip was wonderful! Sorry I hadn't written sooner - I recently got back to the US and have been exhausted. 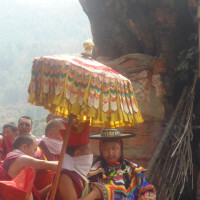 Bhutan was such a amazing country - the scenery, culture, and nicest people! Sonam and Aitta really made the trip special. I had very little knowledge of buddism prior to the trip, but I learned so much - it's incredible how the religion is so integral to the Bhutanese culture. I've already recommended Wind Horse to my friends.....thanks again for making this a once in a lifetime experience! Thanks for your follow-up call. I did, indeed, have a fabulous time in Bhutan. 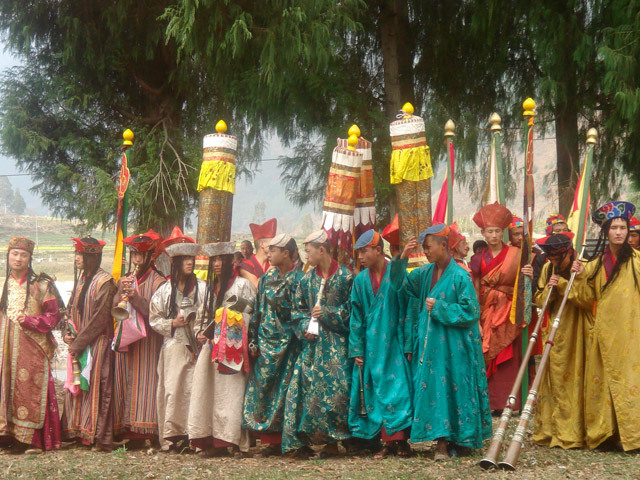 It's a wonderful country and both Buddha and Gyem Dorji were warm and welcoming. They both provided valuable insight and information about Bhutan and its people and both went out of their way to ease my stay there. I don't know exactly when, but I hope to make it back there one day to do some trekking (even though Buddha practically had to push me uphill the whole way to Taktsang!). Thank you again for all your pre-trip assistance. 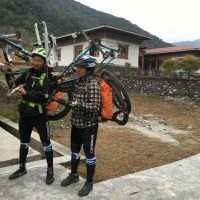 I felt very prepared, unlike other folks I met who were either over or under-dressed or who were taken aback by the sometimes rustic accommodations or roadways. You probably already know that I met Lorraine (from Minnesota) during my travels, who only had good things to say about you and your family. 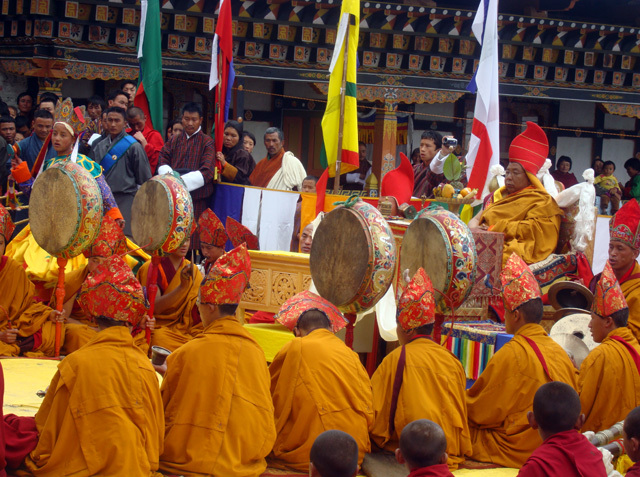 I prepared a travelogue upon my return from Bhutan and have shared it with many friends and colleagues. I think I've whetted many appetitites for travel there. I am attaching my travelogue for you to read. 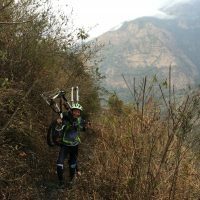 The facts and figures may not be 100% true (in fact, I know I've taken a few liberties), but I think it captures the joy and wonder that I encountered while in Bhutan. 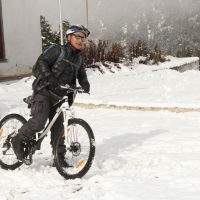 Travel to Bhutan was a dream I had waited to fulfill all my life. When I finally had the chance to go, I found that I had a very window of opportunity right at the height of the festival season. 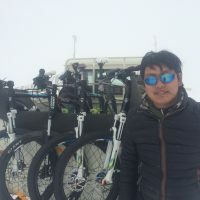 I never thought that any agent would be able to pull off the arrangements at the last minute but luckily, after being turned down by other agencies, I contacted Kinley at Wind Horse Tours, Treks & Expeditions. Due to his energetic efforts and much to my surprise, I was able to squeeze onto the last possible flight. 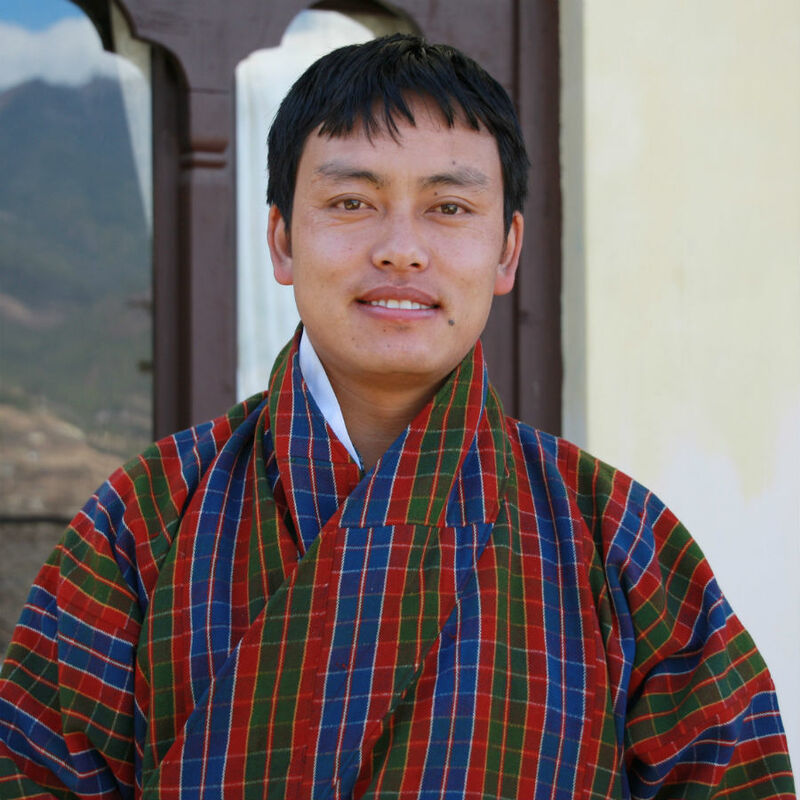 My time in Bhutan was made comfortable by the wonderful guide he arranged, an easy-going, affable gentleman who spoke fluent English. I had researched a lot of the attractions I wanted to see, so I came with a rather formidable list of requests and bombarded Kinley with dozens of questions. He was not only able to make sure that I had a chance to see all of them, but also made a number of suggestions for other points of interest that matched my goals. 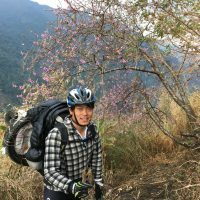 He and the guide were able to work out a schedule that was both full and stimulating but also flexible enough to accommodate some spontaneous changes. 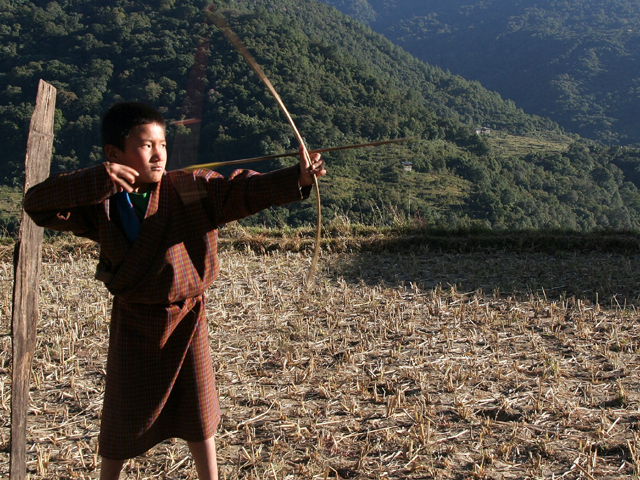 I've always traveled without the use of a tour guide and I hadn't wanted to rely on one for my visit to Bhutan. But the Wind Horse staff did such a fine job, I'm sure I wouldn't have had half as much fun if I'd tried to do it myself. I enthusiastically recommend them for their sincerity and diligence for the sake of their clients.